MEMBERS OF EAST PIERCE FIRE's HazMat Team have been extensively trained and equipped to respond to specific types of incidents. When you have a train track and a couple of highways running through your district, you have to be prepared for anything. Commercial buildings – from storage warehouses to home improvement stores – pose a particular risk. They can contain everything from flammable liquid to toxic materials. 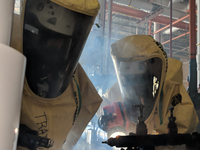 As part of their on-going training, the East Pierce HazMat Team drills once a month, practicing responses to fuel spills, gas leaks and radioactive material spills. They also train to respond to biohazard emergencies and terrorist attacks. Maintaining a large team with all of the proper equipment is an expensive operation, so the East Pierce Team works with the Pierce County Hazardous Incident Team (PCHIT), a multi-jurisdictional response team that includes hazmat-trained firefighters from West Pierce Fire & Rescue, Graham Fire & Rescue, Gig Harbor Fire & Medic One and Central Pierce Fire & Rescue. In addition to the monthly training, the HazMat Team drills with the regional team twice a year - including Washington's own 10th Civil Response Team (10CST), Pierce County Sherrif's Office (Lab Team), Tacoma Fire Department, Washington State Patrol and other state and county organizations. The HazMat Team currently has fifteen members and is lead by Firefighter Pat Risley with assistance from Battalion Chief Rick Goetz and Captain Dan Guenthner.